Johns Hopkins plans to lower Ph.D. enrollment and raise grad student stipends. Johns Hopkins campus: soon with fewer grad students. 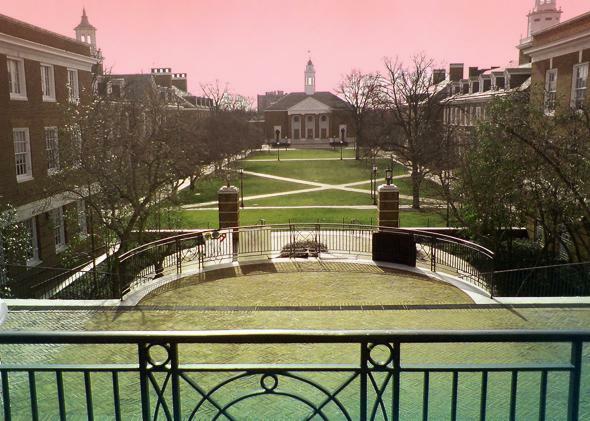 Faculty and graduate students at Johns Hopkins University, an elite private research institution that costs undergrads $61,000 per year, are up in arms about a new strategic plan that proposes sweeping changes (and cuts) to its Ph.D. programs. Some 275 graduate students, concerned about the viability of their departments, have petitioned the university to reconsider, arguing to Inside Higher Ed that such downsizing could be emulated around the country if it takes effect. But these grad students should be more concerned about their viability after the Ph.D.—which is grim. Johns Hopkins knows this, and is taking drastic but needed measures. I’m all for it, and I’d be delighted, not dismayed, if other universities emulated this strategy. This reduction would result in fewer graduate seminars. More importantly, though, instead of roughly one-half the instruction in the university being done by graduate students, only one-fourth would be, and this will put senior faculty in more contact with the undergraduate hoi polloi than they have been in decades. (The fact that Hopkins plans to fire no tenured faculty—merely to force them into contact with undergrads—is why these reductions seem much more reasonable than the ones at, say, Minnesota State University–Moorhead.) Meanwhile, the grad students that do remain will be paid well: that $30,000 is straight-up baller cash in the grad-school world—current stipends at JHU are around $20,000, and I received around $16,000 at UC–Irvine. There are certainly reasons to be apprehensive about this plan. What good is a research university if its faculty and graduate students don’t do enough research? Pushing the boundaries of what is known—creating new knowledge—is a tremendously important job, in all disciplines, from medicine to the sciences to the humanities. There’s legitimate cause to worry that with all that pesky undergrad teaching, Hopkins—and after it every Research I level university in the country—will turn into a mere “teaching school,” those liberal-arts colleges and regional institutions that are looked upon with great scorn by the academically powerful. And Hopkins’ potential new hiring strategies could be a minefield if they don’t do it right: They want to “lean junior” and replace some of the university’s few remaining highly-paid superstars with junior faculty. And that’s great on the surface, but how many of those new faculty will be off the tenure track, subject to dismissal for no reason, afraid to speak freely about important issues because an angry mob could get them fired? They also want to replace graduate TAs with “professional TAs.” Red flag: That means adjuncts, and unless they’re paid a full-time salary with benefits, that extortionate Hopkins tuition will be a blatant rip-off. Nonetheless, the likely shortcomings of the strategic plan pale in comparison to its benefits. First of all, as important as research is, the way it is currently conducted in American universities helps faculty do nothing except head to an early grave. Whereas even a decade ago a single well-received book and a handful of articles were sufficient to secure tenure, nowadays there are many Ph.D.s with those credentials who cannot even land a tenure-track job. And for the lucky ones who do get hired, sometimes nothing is good enough to get tenure, no matter what they do. For example, elite universities such as Harvard are so notorious for denying tenure that Radhika Nagpal’s recent amor fati essay, “The Awesomest 7-Year Postdoc,” became junior-faculty scripture. Just to keep their jobs (or even get their jobs), today’s scholars are forced to produce an absolute torrent of academic publications—that nobody reads, because they too are under so much pressure to write. It’s gotten so bad that Peter Higgs, whose name you might know because it adorns one of the most revolutionary developments in the discipline of physics, is outspoken about the fact that in today’s academic environment, he’d never be hired. For anyone who isn’t a blinkered graduate student or an entrenched member of the academic 1 percent, the Hopkins plan is a revelation. A major research university has finally recognized, openly and publicly, that there are very few good jobs available for recent Ph.D.s in today’s barren and pitiful market. Rather than continue to populate senior professors’ seminars with a phalanx of minions who will then graduate into a jobless hellscape, Hopkins has elected to thin the herds in its own programs. It’s the smartest move I’ve heard a university consider in a long time. It is, simply put, irresponsible to accept so many Ph.D. students when you know graduate teaching may well be the only college teaching they ever do. Expecting wide-eyed, mind-loving intellectuals to embrace the eventual realities of their situations has not worked—yes, they should know better, but if they listened to reason, they wouldn’t be graduate students in the first place. Institutions do know better, so current Ph.D. recruitment is dripping with disingenuousness. I sympathize with Hopkins grad students up in arms about this decision; they’re worried about the fate of the vibrant research environment where they will apprentice their future careers. But the truth is that most of them will never work at a research university. Given this market, many of them will never teach on the tenure track at all. Grad students fret that hiring “professional TAs” will worsen the problem of “adjunctification.” Bless your hearts—you know what will worsen that problem? When you and all your friends become adjuncts in five years. Cutting Ph.D. enrollment is responsible and humane, especially when you offer those remaining suckers 30 grand a year. If they stay in academia, it’s likely the biggest salary they’ll ever get. Yes, it may hurt some high-ranking professors to restructure the American university so that it actually addresses the scorched job market. It will “hurt” them by allowing them a respite from the breakneck pace of research that actually keeps them from living “the Life of the Mind” to the fullest. It will “hurt” them by forcing them to be in contact with non-advanced students. In short, it will “hurt” them by making their jobs more like the jobs of the vast majority of university professors in America. Most professors, after all, are adjuncts. Why, exactly, should we rush to defend the very system that psychologically, structurally, and financially enables our exploitation—exploitation that begins at the Ph.D. recruitment stage? I can’t speak for any other adjunct in America, but this adjunct is quite supportive of the Hopkins strategy. It’s smart, it’s realistic, and it’s brave.